Brevet 2nd Lieutenant, 2nd Lieutenant, and 1st Lieutenant, 4th Artillery, 24 June 1861. 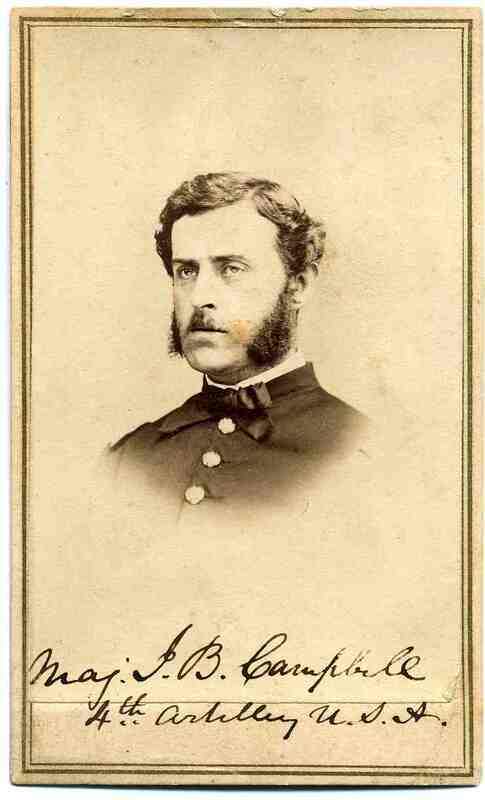 Brevet Captain, 30 August 1862 for gallant and meritorious service at the Second Battle of Bull Run, Virginia. Brevet Major, 17 September 1862 for "gallant and meritorious service" at the Battle of Antietam, Maryland. Captain, Additional Aide-de-Camp, 16 May 1862. In command of Battery B, 4th United States Artillery, assigned as part of the 1st Division of I Corps' Artillery. He deployed his guns in very close support of the Division's assault through the Cornfield early on the 17th, and was crucial in helping to stop the charge of Hood's Division. Capt Campbell was wounded during that fighting and command of the Battery fell to Lt Stewart. Mustered out as Captain, Additional Aide-de-Camp, 10 July 1865. Captain, 16th Infantry, 28 July 1866, declined. Captain, 4th Artillery, 5 February 1867. Major, 2nd Artillery, 1 July 1891. Participated in the following Indian Wars: - Sioux, 1876. Reference found to CAPT Campbell as Chief Executive of Alaska (1874-76!) when it was under Army jurisdiction. General data: Heitman's. ; Officer data from the lovely Battery B website. Alaska Reference on Explore North site. His gravesite is on Findagrave. Image above from a CDV kindly provided by Scott D. Hann, from his collection.